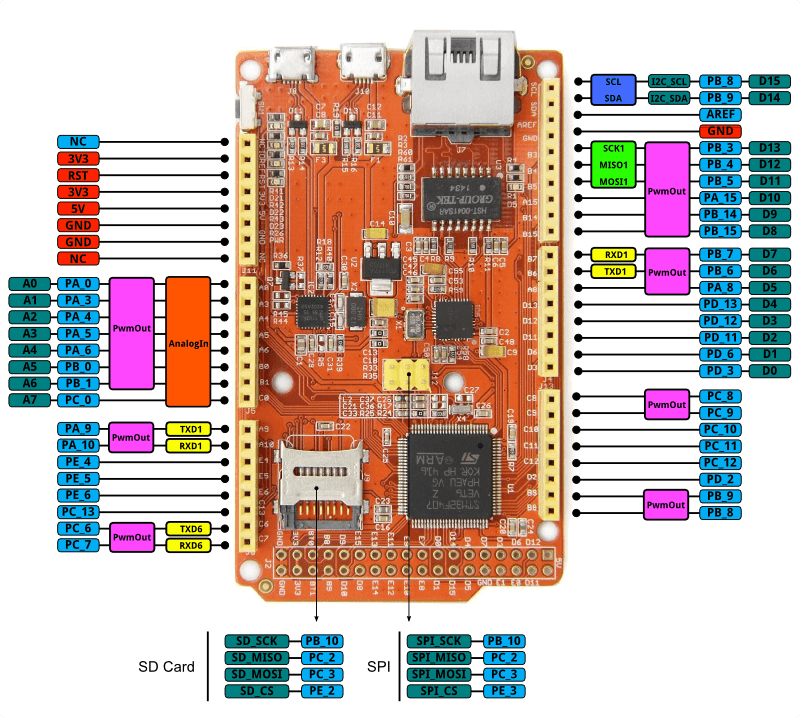 The Arch Max is an mbed enabled development board for rapid prototyping. It's based on a STM32F407VET6 microcontrolle with an ARM Cortex-M4F core running at 168MHz. It includes an open link to provide SWD debug, drag-n-drop programming and USB serial communication. We've reported we shipped Arch Max with wrong DAPLink firmware. Please check your DAPLink firmware version by opening MBED.HTM, and if it opens Arch page(not this Arch Max page), please update your firmware by reffering here. USB receptacle for DAPLink(Mbed I/F) is J8. LED for blinky can control as D13. When using an I2C module, please check if it has I2C pull-up resistors. If not, the pull-up resistors should be added, as the I2C pins of the Arch Max are general purpose I/Os and don't connect pull-up resistors. Your mbed Microcontroller can appear on your computer as a serial port. On Mac and Linux, this will happen by default. For Windows, you need to install a driver: mbed serial configuration. We can use the serial port to log debug message, or use offline toolchain to debug step by step. The latest firmware version for the Arch Max is v0246 built at June 28 2018. To check your firmware version and built date, open the MBED.HTM or DETAILS.TXT of your MBED disk in a text editor. The firmware v0221 2015-02-03 for Arch Max fix Mac OS X 10.10 readonly fs bug and improve stability. To compile a program for this board using Mbed CLI, use arch_max as the target name.